Van Gogh and Gauguin, apart from being friends, shared a deep artistic bond that often manifested itself in the form of heated arguments on art. 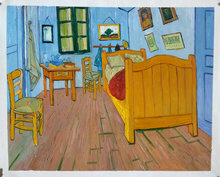 Van Gogh painted this piece with a lot of stress being placed on the composition. Apart from this, he also made use of ambient light to give the chair in the painting it’s own identity, different from the actual subject. Our artists have studied Van Gogh’s techniques in great detail. By paying close attention to his brushstrokes and techniques, we can deliver a piece that is close to what Holland’s most revered artist had originally created. 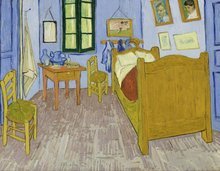 Van Gogh and Paul Gauguin, another incredible and famous painter, shared a tiny cottage in Arles after Van Gogh moved out of his brother Theo’s house in Paris. While sharing this space, the two aspiring artists would often end up arguing rather vehemently on a lot of topics, particularly those related to art. Once, Van Gogh even made the extreme decision of physically harming Gauguin and approached him with a knife. Gauguin managed to diffuse the situation, however, it was soon becoming evident that it would be hard for both of them to live under the same roof. Van Gogh, in particular, was quite saddened that things had gotten so bad between the two of them, and would regularly paint to make Gauguin happy. A classic example is when he drew large paintings of sunflowers and hung them around the house, including Gauguin’s bedroom, to ease the tension in the air. 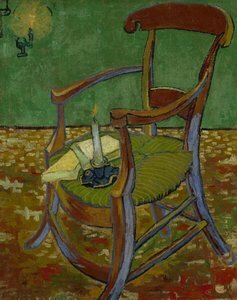 Van Gogh painted two paintings with chairs as subjects, particularly, Gauguin’s chair, and his own chair. 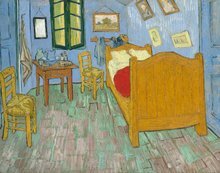 Both were painted at different times of the day and Van Gogh experimented with capturing the effect of ambient light in the rooms. Gauguin’s chair is illuminated by a candle, which suggests that this was painted in the evening/night. Another fascinating aspect of this painting is the intricately designed carpet below the chair, which is reminiscent of the Japanese-inspired works painted during his stay in Paris.